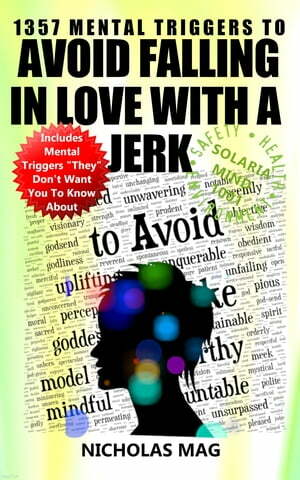 Collins Booksellers - 1357 Mental Triggers to Avoid Falling in Love with a Jerk by Nicholas Mag, 9780463903711. Buy this book online. Do you need a Miracle? Yes, this is possible! This book is specially configured (order of words) for you to Avoid Falling in Love with a Jerk. Quick effects. Some people reported beneficial effects from the very next day. However, beneficial effects occur between 3 days and 3 months, only in very rare cases it takes a longer time (6 months - 1 year). BUT I strongly recommend you to keep reading 3 mins (at least) a day, minimum 3 months because in this way the effects are very stable. You don't need a big chunk of your time or expensive programs. In this detailed and simple book, you find all the information you need. It gives you in detail a practical, very simple, effective and successful method. This book is a practical book that has over 350 pages. This book describes in detail a practical, very simple, effective and quick-action method called Solaria Mind 1001 (NEW), that helps you to Avoid Falling in Love with a Jerk. In short, the Solaria Mind 1001 method consists of using positive thoughts, words, affirmations, emotions, and images.